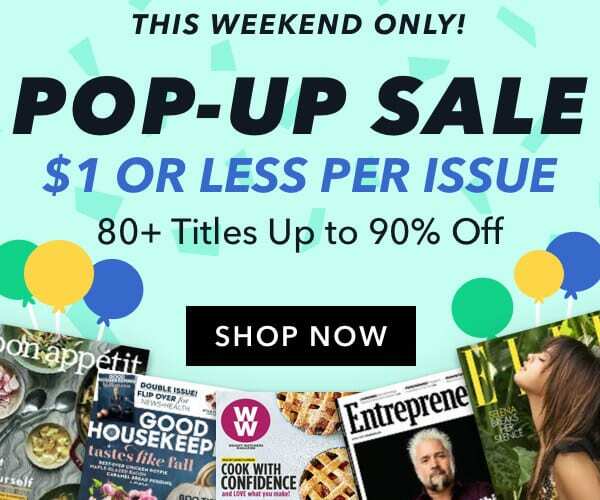 I love this magazine sale! It usually only happens a few times a year and when it does I stock up BIG for friends and family. The holidays are right around the corner. Why not get everyone you love a magazine subscription for under $5? Yes, you read that correctly! So many amazing titles are up for grabs this weekend only and will run you less than a cup of your favorite overpriced coffee. LOL! Come on – stop pretending you don’t splurge on that stuff. We all do. Here are some of the titles that are included! Click here to see them all. Whether your mother loves Elle or Cruising World, there is a magazine on sale that is just perfect for her! Or better yet, splurge on yourself and get those cooking magazines you’ve been meaning to subscribe to but haven’t because of time. One click and BOOM – 12 months of fun.